With every trip around the Sun we gain a little more wisdom. Some of us do, if not necessarily your old Uncle Rod. Yep, Unk just celebrated yet another birthday this past Sunday, muchachos. Miss Dorothy made it a lovely day, taking me out to see the new Harry Potter movie and to supper at my restaurant of choice. Naturally, I chose Bass Pro. Birthday present? One of Orion’s new 50mm guide scopes. Which is cool, since I have been itching to get out with the DSLR and take my yearly snapshot (I will not glorify my work with the hoity-toity term “image”) of M13. When you get to my age, which, while I will not enumerate it for you, is roughly “almost over the hill, but not quite,” you become a little reflective on your birthday. Me being who I am, my reflections turn to amateur astronomy. As of 2011, I’ve been an amateur for 46 of my years if you count that as only the years I’ve owned a telescope, or closer to 50 if you count my first fumbling steps with toy binoculars. Yeah, I’ve been thinking about the last five decades of amateur astronomy and thought you might enjoy hearing how it has changed and not changed. It all boiled down to Newtonians. Oh, if your name was Mr. Moneybags you could have something prettier or a bit more exotic, like a beautiful Unitron refractor, but most of us could barely dream of coming up with 200 bucks for a six-inch Criterion RV-6 Dynascope. If you did accumulate that 200 somehow, by bagging groceries all through high school or mowing uncounted lawns, what did you get? Good optics, usually, on a heavy but shaky mount and an AC synchro-motor clock drive. Plug it in and it tracked (sort of); unplug it and it stopped. If you were like me and my buddies in our little club, the BAS, the Backyard Astronomy Society, you had to settle for Ramsdens and Kellners and were happy to have ‘em instead of the truly dreadful Huygenians. What did all these eyepieces have in common? Narrow apparent fields and simple, uncoated optics. Given that almost to a man (not many women in amateur astronomy in those benighted times) we were using long focal length scopes, the images they produced were actually pretty good. Naturally, some of us wanted to take pictures of what we saw. Which wasn’t easy. Never mind the films we had, which were either slow or grainy or both, our telescope mountings and drives weren’t up to the task of long exposure deep sky photography. Evered Kreimer did amazing work, sure, but to do that work he had to heavily modify his 12-inch (huge) Cave and build his own chilled emulsion camera (don’t ask, sprouts). Most of us were lucky to get a few blurry afocal Moon pictures using Rube Goldberg camera mounts. Make that “magazine” if you were a U.S. amateur. Oh, there were some small press publications like The Strolling Astronomer, but only one big commercial mag, Sky and Telescope, natch. What was it like? Considerably more formal than today and less accessible for novices, I reckon. I loved it anyway. Would I, like some curmudgeons, want to go back to the old Sky and Scope? Not on your life. While some old-timers complain there’s less theory and math in the new magazine, it was never the APJ nor was it intended to be. Today’s magazine looks better and reads better—by far. There were a few in the 60s. There was Stellafane, of course, and a couple of gatherings out on the west coast, but big, organized star parties hadn’t caught on yet, maybe because the mercury vapor streetlights were just beginning to multiply and most of us could still observe profitably from our backyards. Which doesn’t mean we observed alone. Some of my best memories of the early days were the “star parties” (we didn’t call them that) the BAS would hold in a vacant lot or in a member’s backyard. Yeah, our scopes were tiny, and we tended to devote at least part of our evenings to tentative discussions of GIRLS or even more esoteric subjects (who would win a battle between Superman and Spiderman? ), but those were some of the best observing runs of my life. 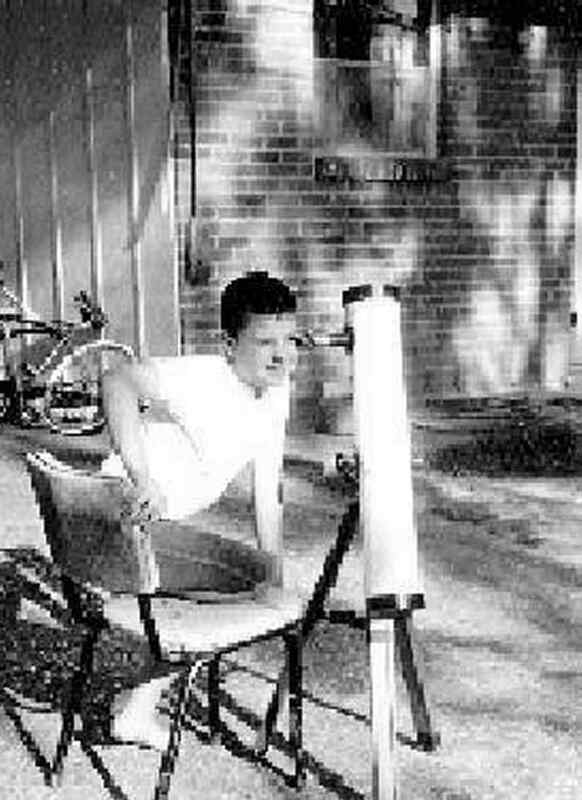 As I have said before, I had the odd idea that amateur astronomy was mostly a kid thing. And in a way it was. A lot of the people practicing amateur astronomy the way me and my buddies did—just for fun, for KICKS—were members of the young set. 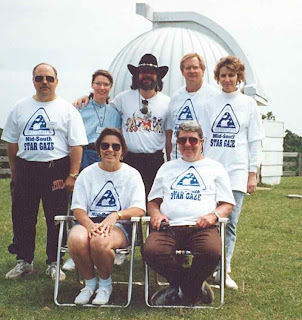 The folks you saw in The Magazine, decked out in coats and ties in the “Amateur Astronomers” column, were focused on the serious: variable star observing, monitoring planets, measuring double stars. I admired those “professional amateurs” (more professional than amateur me and my pals thought) then and salute them now, but, truth is, today most of you enjoy our avocation more like how me and my buddies did. The fact that a surprising number of younguns were interested in astronomy back then is testament to several things. In toto, our culture was more forward-looking and less self-centered than it is today, with grand adventures seeming more doable. The space-race was on and in the headlines and in our consciousness all the time, and there were fewer distractions. No Nintendo and only three TV stations in the ‘Swamp meant you had to find something to do when the month’s comics were read and you’d had enough of Tom Swift and The Hardy Boys for a while. I got started (with a telescope) in 1965 with a fairly horrible 3-inch Tasco Newtonian, moved on to my beloved 4.25-inch Edmund Scientific Palomar Junior shortly thereafter, and stayed with that for a few years. Which was probably a good thing. I’d get aggravated by my books’ warnings that “so and so an object requires a 6-inch,” but I didn’t let that stop me, and having to stretch with 4-inches probably made me a better observer. By the time the decade was running out, I had a 6-inch, but not the Super Space Conqueror or the RV-6 of my dreams. Instead, I built a homebrew pipe-mount sixer that was as crude as crude could be. I loved it, of course. If there were ever a clear cut demarcation between one decade of amateur astronomy and another, it is between the 60s and 70s. That was when Celestron, who had been producing uber beautiful and uber expensive SCTs for schools and amateurs like Johnny Carson and Hugh Downs, decided they wanted to sell to the masses and came out with the vaunted Celestron “Orange Tube” C8 at a price we could at least dream of affording. 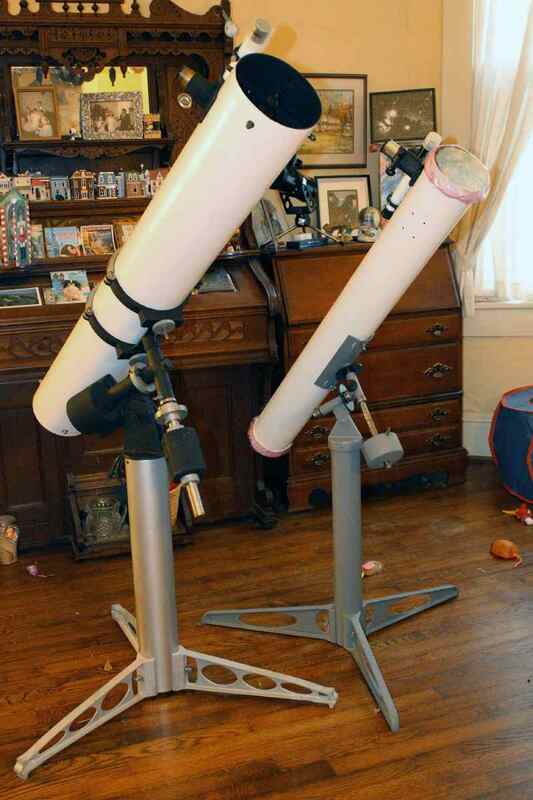 Amateur astronomy was changing, and the new scope was just better suited for the new realities. Many of us now had to travel to get to dark skies, the gas crunch had radically downsized cars, and a lot of Joe and Jane (there were more Janes now) amateurs wanted to do astrophotography. The 60s Newtonian wasn’t very good at any of these things. The Orange Tube C8, conversely, was good at these very things. Thus was a legend born. Things were getting better here—if slowly. Yeah, the bread and butter was still Kellners and Ramsdens, but more and more of us were glomming onto the idea that eyepieces were as important as telescope mirrors and were beginning to embrace Orthoscopics and even more exotic eyepieces. The first ocular that really blew me away was an Erfle I got from Jaegers. No it wasn’t perfect at the edge, even in my f/10 SCT, but, man, all that field! Over 60-degrees! As with eyepieces, we were beginning to make a little progress. The top workers were moving from chilled film to hypered (“hypersensitized” with hydrogen gas) film, but the rank and file were just beginning to find our feet with SLRs. Better cameras helped, but we were still struggling to get decent pictures will emulsions like Tri-X. Sky and Telescope was still more than recognizable, if beginning to add color and becoming a wee bit less starchy-stiff. Astronomy Magazine came along in 1973 with the coming of notorious Comet Kahoutek and brought lots of color pictures (for the day), pretty ones, and showed there was indeed room for two big astro-rags. I’ve liked Astronomy since the night I bought my first issue at Bookland in the Possum Swamp Mall, but I've never loved it like I've loved S&T. 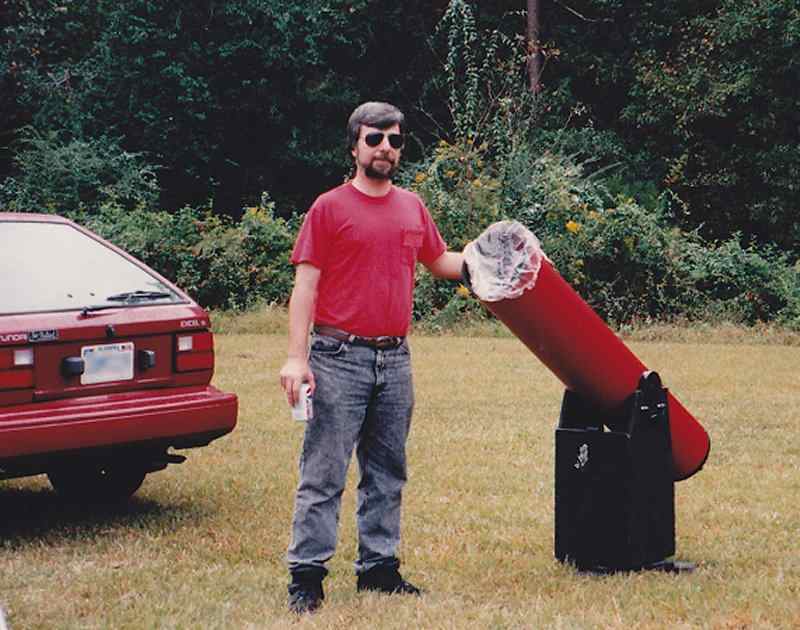 They didn’t really break big till the next decade, but quite a few amateur of the 70s discovered that not only was it fun to observe with lots of friends, a star party was a convenient way to get the dark sky experience they were denied at home. Clubs were beginning to pop up in some odd places—I’ve decided our silly little BAS was indeed a real astronomy club—which was good. One thing was becoming obvious, though: the Astronomical League, which in the sixties some of us imagined would become the American equivalent of the Royal Astronomical Society of Canada, turned out not to be that. Oh, plenty of clubs in the 70s were AL affiliates, but the League, it became clear, would never attain the importance to us the RASC had for our brothers and sisters to the north. Why? I’m still not sure. Maybe it’s that streak of American individualism, which seems to be especially virulent in amateur astronomers. 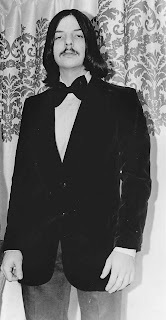 One word sums up the 70s: “hangover.” Apollo was done and, in the wake of ‘Nam, nobody much cared. Neither government nor people were interested in pushing on to Mars. We wanted to forget the sixties and disco our little hearts out. 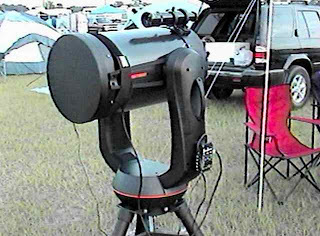 The Schmidt Cassegrain ruled the roost for this decade, no doubt about it; not only Celestron with its Super C8s and Powerstars, but upstart Meade with luscious looking LX3s, 5s, and 6es. And yet, and yet…another sort of amateur astronomy was being born, one fostered by folks who didn’t want to take pictures, but who, instead, wanted to see the deep sky in detail with their own eyes. There was this dude, John Dobson, in San Francisco. While we’d occasionally seen mention of him in Sky and Scope, it took his idea, which concerned very large and very simply mounted Newtonians, a goodly while to catch on with the Stellafane and (even) Riverside crowds. But plenty of other amateurs sat up and took notice and soon Dobs were all the rage. That was helped along by a well-known 60s optics maker, Jim Jacobsen’s Coulter, who were soon offering the Odysseys, insanely huge telescopes at insanely low prices. This is easy to sum up: the decade began with Erfles and Orthos and ended with Naglers and Wide Fields (the precursor to the TeleVue Panoptics, younguns). Combine the genius of Al Nagler with the needs of owners of fast, un-driven telescopes, and we were soon enjoying Unk Al’s vaunted “spacewalk” experience. Not much movement here. We were still using single lens reflexes and guiding them manually by staring at guidestars for hours on end, mashing hand-paddle buttons when they wandered. Film emulsions were getting better for astrophotography, though, and Fuji began offering some color print films that pointed the way for those of us who wanted to see the universe in living color. We also began to get a lot of nifty imaging accessories from Dr. Jack Marling’s Lumicon (he also turned us on to light pollution reduction filters in a big way). Sky and Telescope was just as good as ever, maybe even better. It certainly looked better. In this decade, it came under the stewardship of yet another legendary S&T Editor, Leif Robinson. Astronomy Magazine? It was flourishing under Richard Berry. In the 1980s, the star party as we knew it was born. Not something focused on telescope making like Stellafane or Riverside, but something focused on observing and having a good time with your buddies. Astronomy club membership grew by leaps and bounds with the coming of Halley’s Comet. When the comet of the century turned out to be a near bust (for the general public), alas, membership plummeted. We regrouped, and things slowly began to get back to normal. This was also the decade where we got a glimmering of what them new-fangled microcomputers, especially when equipped with modems, would mean for our pursuit. Halley would change everything. Everybody would want a telescope. The Possum Swamp AS would soon have hundreds of members, not ten (if you counted pore old Elmer who slept through every meeting). With the poor showing of Halley, it all came to naught. The end of the decade was a time for retrenching. There are several telescope threads running through the 1990s. Dobsonians continued their march, morphing from hot-water-heater-like Sonotube things into the modern truss tube configuration. Apochromatic, color free, refractors were hitting the big time for those with the $$$ to sample their charms. But THE telescope story? 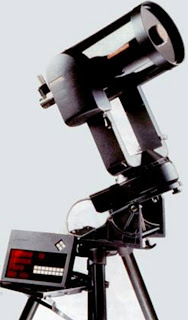 The introduction of the Meade LX200 SCT in 1992, the first practical and affordable go-to scope. We are still feeling the reverberations from that. Uncle Al continued to improve his spacewalk wonders. The Wide Fields became the Panoptics and the Nagler IIs were born. Amateurs were suddenly apparent field crazy, and people noticed, including Meade, who introduced their own lines of Nagler-like and Panoptic-like oculars. The mid years of the decade also bought the Radians, which are on their way out now. Shame. My late friend Jeff Medkeff said they were the best planetary eyepieces ever, and if anybody should have known, it was the talented Jeff. Slowly, ever so slowly, film was dying and CCDs were becoming not just a curiosity, but something the average amateur astrophotographer could consider trying. 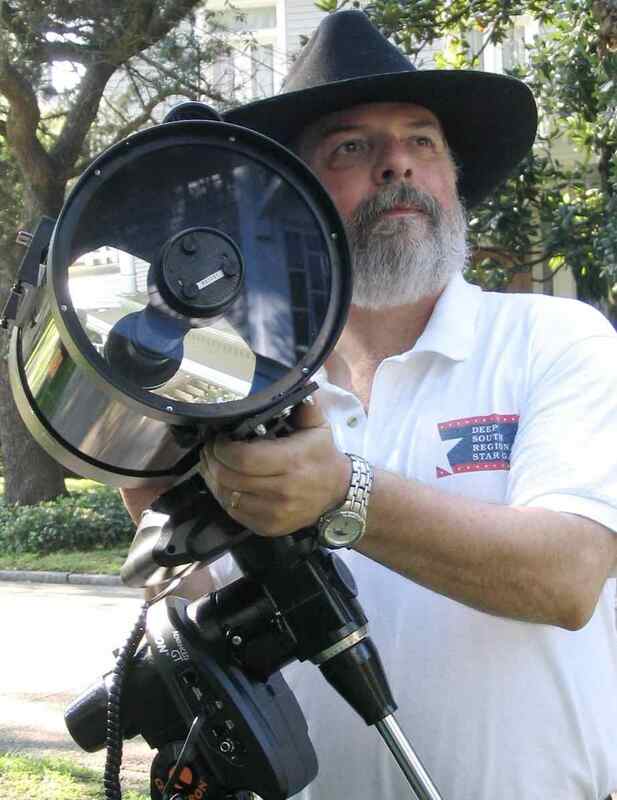 One big impetus for that was Richard Berry’s Cookbook CCD camera. Yeah, I know it seems antique now with its tiny chip and windshield washer pump cooling system, but, man, was it a revelation back then. Even old Rod built the circuit boards for one (though he and the PSAS didn’t get much farther than that). Sky and Telescope continued on its merry way in the capable hands of Mr. Robinson. Astronomy Magazine? The early 1990s saw the Editorship of the magazine, which was now owned by Kalmbach Publishing, an outfit known for model railroading and similar “hobby magazines,” pass from Richard Berry to Robert Burnham (a.k.a. “the other Burnham”). Mr. Burnham was talented and capable, but somehow it just wasn’t the same. If they were coming into their own in the 80s, in the 90s they established themselves as a permanent fixture of the amateur astronomer’s life. After my first visit to the Texas Star Party, all I could say was “Why didn’t we think of this earlier?” The skies at home were never, ever like those of Prude Ranch. 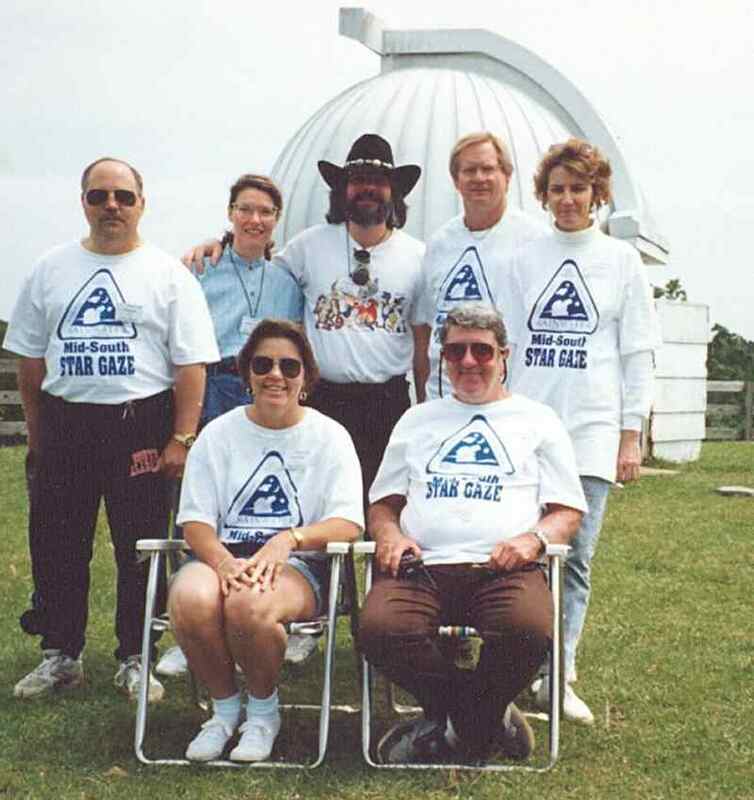 This was the decade when many of us began to wonder if the local astronomy club was doomed. After all, you could long onto s.a.a. on the dern computer and attend a “meeting” anytime you wanted. That turned out not to be the case. Oh, you could get on s.a.a. anytime, but it wasn’t the same as seeing your fellow observers in non-virtual space. Today, s.a.a. is long gone (for all practical purposes), but the astro-club lives on. Otherwise? This was a huge decade for us. Many of the features of today’s amateur astronomy—computers, CCDs, APOs, go-to—became popular in the 1990s. In the wake of the Voyagers and the repair of the Hubble Space Telescope, public interest in the Great Out There began to reawaken a little bit, at least. And if Halley was something of a bust, the one-two punch of Hyakutake and Hale-Bopp convinced the public and the media that, yes, comets could be cool. This was a great time for me. I got divorced, met the beautiful and wonderful Miss Dorothy, and got married again. I didn’t spend too much time mourning my lost Super C8 Plus, which I sold to help finance said divorce; I replaced her with a much better telescope, an Ultima 8, my Celeste, whose OTA I am still using 16 years down the line. We are a little close to the decade to decide on the major telescope trends, but I'll try. Small and fine APO refractors lost steam and the humble SCT made a strong comeback. Celestron, especially, introduced some classic scopes—like the NexStar GPS line. Above all, it was the decade of China. Synta was an ever greater force as the years rolled by, not just filling the catalog of Orion with cheap but good telescopes, but even buying Celestron, ensuring their continuing presence. Following Leif Robinson’s retirement, Rick Fienberg and current Editor Bob Naeye and their colleagues continued the grand tradition and began moving The Magazine into the 21st century, putting all the back numbers on DVD and offering “digital” subscriptions. Astronomy Magazine was in good hands, too; those of long time amateur and writer Dave Eicher. 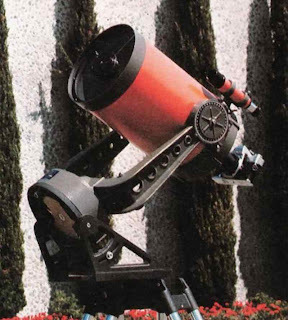 Oh, lest I forget to mention it, the decade saw the rise of some wonderful small press amateur astronomy magazines, including Amateur Astronomy Magazine and Astronomy Technology Today. Things were quiet for a while on the eyepiece front, with not much going on other than some fine-tuning of the TeleVue line and the arrival of excellent and (relatively) inexpensive 80-degree AFOV eyepieces from China. Then Unk Al did it again, with his Ethos eyepieces, which featured 100-degree apparent fields and crazy-good images. These were followed not long after by similarly wonderful “100s” from Scott Roberts’ new company, Explore Scientific. I expect Explore to become the next big name/force in amateur astronomy, by the way. You read it here first, muchachos. The big news along these lines was not star parties per se, but amateur astronomy “communities” like the Chiefland Astronomy Village and Deerlick Astronomy Village. With the huge cadre (in a small amateur astronomy way) of Baby Boom amateurs nearing retirement and quite a few folks picking up amateur astronomy in retirement, I expect “astronomy subdivisions” to become ever more popular. Almost as soon as the decade came in, Unk, like most of y’all, embraced go-to. He also became a steadfast proponent of deep sky video cameras, and it looks like ever more of you are agreeing with him on that, too. CCDing? Uncle Rod eased into it with a Starlight Xpress MX516, moved up to a Meade DSI, and topped out, thus far, with an SBIG ST2000. Tell the truth, simple minded and fumble fingered as he is, Unk prefers a DSLR. Scopes? Big Bertha, our NexStar 11 GPS, came to Chaos Manor South in 2002, and is still rockin’. Celeste, the C8, is still with us, but in 2005 she was DEFORKED, and is now riding on a Celestron CG5 or an Atlas EQ-6. So? All I can say is what a long, (sometimes) strange trip the last 46 years have been. Would I like to go back to the 60s? Well, there is always the desire to recapture that sweet bird of youth and see all those cool sky objects for the first time again…but…nah. I wouldn’t go back on a bet. I am having as much fun or more today than I ever have had and am happier with Miss Dorothy at my side than I ever was or ever could have dreamed of being. A belated Happy Birthday Rod. Thanks for the recap of the last five decades in astronomy. Hope to see you at next months MOSP. No spell check here, I'll go ahead anyway. It's like this Rod, lately (passed couple of years really) I become disenchanted with astro stuff. I figured out sort of why. Spent WAY to much time moderating, and trying to involve myself with astro. Got big time disconnected from astro, when I thought I was right in the middle and on top. I stopped viewing as much as I used to. I stopped just hanging out in my roll off. I never stopped looking at the stars for a few minutes on a clear night, no scopes, just looking. I thought, why have this astro stuff anyhow? Cost a lot, useing it so little. Man, you bring me right back to why of it all. I let my magazine subscriptions slide even. Your writing about those goodies, got me back to S&T and Astronomy. Just wanted to say, really, your blog site keeps the joy of astronomy alive for me. Thanks for the site Rod. And I gotta say, I'm as happy with my Linda as you are with Miss Dorothy. Thanks for that trip down memory lane, especially the reminiscing of the Pentax K1000 SLR, the camera I cut my teeth on in the late 70's (and still own). Although I only recently re-lit the fires of the sky's wonders, this time around it's hit me hard! I just wish I had the eyesight that I did 30 years ago. Some complain that the hobby has become too expensive, but I've found that with a little research and ingenuity one can enjoy this hobby on a shoestring budget. There's always someone upgrading to the latest, greatest and most expensive stuff, and I don't mind taking their "seconds" off their hands at a fraction of the price of new. I'm perfectly happy with equipment that bring in a few less photons that these old, tired eyes would not be able to detect anyways. Thanks again for your dedication to this blog, which I look forward to reading each and every Sunday! 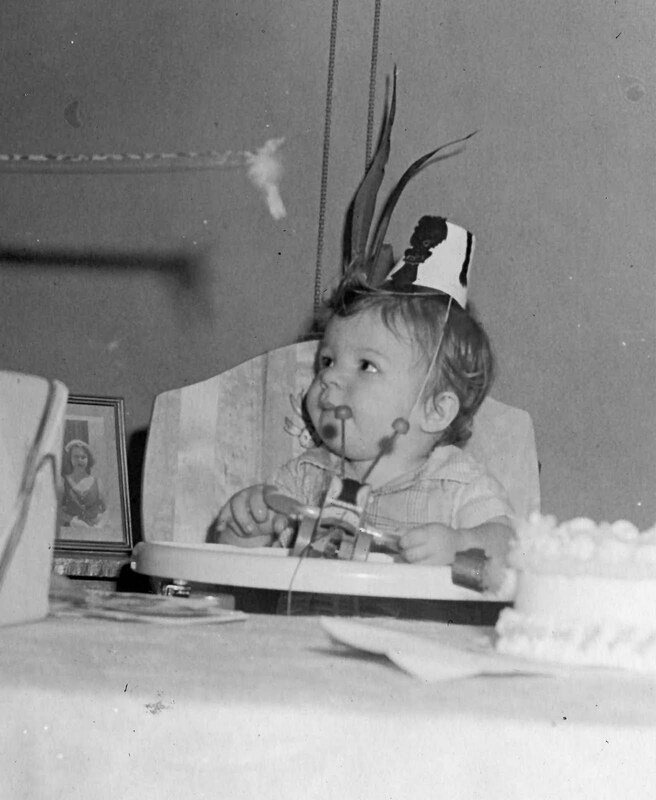 I'll jump in here and wish you a happy birthday (belatedly) as well. I really look forward to Sunday's to get the next issue of your blog and enjoy your trips dowm memory lane. You need to quit bemoaning your growing older, 'cause I do believe that we're of pretty much the same vintage. My first Jalopy was a 1964 Ford Custom with the 289 V-8 back around 1970-71.